In response to the recent letter entitled ‘Town’s gone to the dogs’, I feel compelled to give my own experience of living in Whitley Bay. I moved to the area about 18 months ago and I can’t believe my good fortune. It’s such a great place to live, with so much to do, and I’ve met so many wonderful people here. Apart from the obvious attraction of the sea, the beaches, St Mary’s Lighthouse, the new promenade and restored Dome, Whitley Bay offers so much. There are some lovely cafes, restaurants and bars, as well as great shops, including charity shops and unique independent shops, and Green Beans market. New businesses are opening up all the time. There is something to suit every pocket and every taste. It has a cinema, a film festival, a Playhouse and such an arty vibe. I’ve met artists, authors, poets, publishers, designers and gardeners. 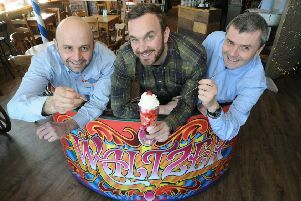 There is a wonderful sense of community and local support, and a diverse range of events at Whitley Bay Big Local, including the annual carnival. There is a great sense of pride and forward-looking sustainability, with beach cleans, litter-picking, and the Station Master’s Community Garden. There is the usual array of hairdressers and alternative therapy businesses, GPs, dentists and opticians, as well as the nearby North Tyneside Hospital. It’s a shame that old favourites like Woolworths closed, but that was 10 years ago and they all closed in the UK, not just in Whitley Bay. Considering the number of dogs in Whitley Bay, there isn’t that much dog muck lying around. Most owners are responsible otherwise there would be wall-to-wall dog muck filling every road, park and beach.